When I picked Joe up from nursery yesterday, his key worker said that he had been drawing smiley faces and showed me a photo she had taken of one he had done on a white board; a little scrawled shape in red marker pen. I was amazed. Up until then, I had never seen him properly draw anything. Yes, he can brilliantly write his own name, which he takes great care and attention over, but when it comes to the more artistic side of things, his technique has tended to be the crayon-in-a-fist-scribbled-as-fast-as-possible-over-the-entire-piece-of-paper approach. When we got home, I asked him if he would draw a picture for mummy and daddy. 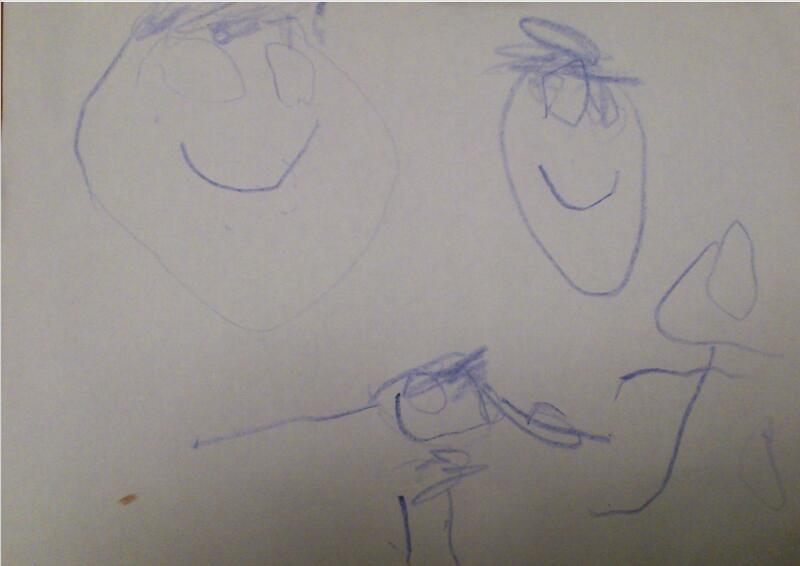 He said he would draw a picture of mummy and daddy. Just to clarify – there is no little sister or brother. Or at least not that I’m aware of. Evidently the fact that two of his good friends from nursery have got younger brothers may have swayed his decision on this one. I was still trying to get my head round the fact that he was basically telling us to get on with it and provide an immediate sibling for him. My heart melted. I gave him a big cuddle. He decided halfway through that it was Grandma and Grandad instead of mummy and daddy; he even gave Grandma glasses. Then he drew himself at the bottom, with long outstretched arms coming out of his head in the wonderful way all young children seem to draw people. Every face had a smile on it. With a flourish, he wrote his name in the corner, running out of room for the ‘e’ but he made it work anyway. As he held it aloft for our appraisal, I felt both proud and emotional. My little boy is growing up. My little boy is clever. My little boy is happy. My little boy would make a wonderful big brother.